We make your car talk, just enjoy the OBD Telematics leading bySinocastel ! 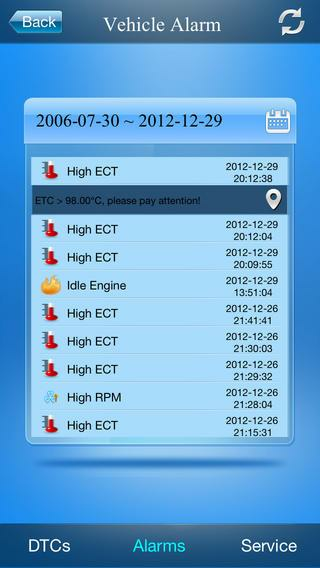 -ECU Data stream: coolant temperature, RPM, Emission, engine load,DTCs, speed control and etc. -Important driving alarms records, like speeding, hard acceleration/deceleration, low voltage, high RPM, high coolant temperature,idling, etc. -Detailed DTCs list viewing: Occurred date, time, severity level,reasons and solutions. -Services: Maintenance tips according to vehicle healthcondition. 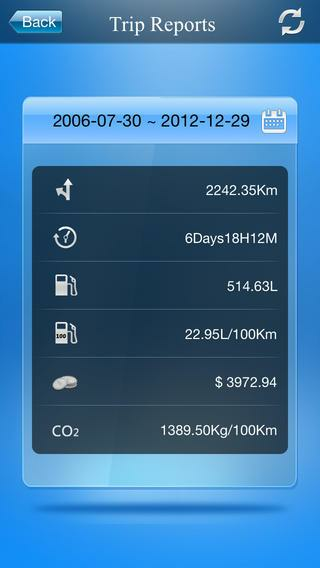 -Detailed trips records with mileage, driving time, fuelconsumption, fuel cost, Emission. APP分為4個模組1. 定位服務即時定位線上車輛，查看路況、車輛的資訊和行駛軌跡。2. 統計報表車輛的各項支出費用的統計，包括綜合報表、費用報表、里程油耗報表、警情&故障報表、駕駛行為報表。2.1綜合統計針對車輛某一段時間內的綜合資料查詢，包括里程、油耗、警情次數、故障次數、駕駛時長、駕駛行為的資料查詢。 2.2費用統計包括：維保費統計、年檢費用、證件續費和其它的費用。其中油費是由終端採集的，其它的費用需要管理員在WEB平臺錄入。 2.3里程油耗統計對車輛某一時間段內的里程、油耗和駕駛時長進行統計，以圖表形式展示，管理員可以對比每個月的里程油耗情況。 2.4警情故障統計可以查看車輛發生警情或故障的類型和次數，點擊明細，可以查看每個車輛的警情或故障次數詳情。 2.5駕駛行為統計針對司機駕駛行為的統計，並列出車隊司機的駕駛行為排名。3. 消息處理查看車輛的警情消息、故障消息，可以查看警情故障發生的位置；保養年檢提醒，可以查看處理詳情和保養費用。消息提醒在應用和手機推送同時進行。4. 設置APP的相關系統設置，登錄密碼的修改等。APP is divided intofourmodules1. Locate the serviceOnline real-time location of vehicles, view traffic, informationandtravel path of the vehicle.2. Statistical ReportStatistics of the expenses of the vehicle, includingtheconsolidated statements, expense reports, gas mileagereports,alarm & fault reporting, driver behavior reports. 2.1 General StatisticsFor comprehensive information on the vehicle within a certainperiodof time queries, including mileage, fuel consumption, thenumber ofpolice intelligence, the number of failures, when drivinglong queryinformation on driving behavior. 2.2 cost statistics Include: Victoria premium statistics, annual fees,renewalsand other documents costs. Wherein the oil fee is collectedby theterminal, the other costs need to enter the administratorWEBplatform. 2.3 gas mileage statistics For a period of vehicle mileage, fuel consumption anddrivinglong proceeds statistics, graphically display,administrators cancompare the gas mileage situation each month. 2.4 alarm fault statistics You can view the type and frequency of vehicle alarm orfaultoccurs, click Details, you can see the number of alarm orfaultdetails of each vehicle. 2.5 driving behavior statistics Statistics for the driving behavior of the driver anddrivingbehavior listed in the team rankings.3. Message ProcessingView of the vehicle alarm messages, fault messages, you can viewthelocation of police intelligence failure occurred;maintenanceinspection reminder, you can view process details andmaintenancecosts. Message reminding simultaneously push theapplication andthe phone.4. SetAPP-related system settings, password changes and so on. The APP provides visualization of geographical location informationfor Castel family business products, the humanized instructionsissued and parameter setting enables the user to track and monitorother Castel family business products at the same time. APP分為4個模組 1. 定位服務 即時定位線上車輛，車輛的資訊和行駛軌跡。 2. 統計報表車輛信息的統計，包括綜合報表、里程油耗報表、警情報表、駕駛行為報表。 2.1綜合統計針對車輛某一段時間內的綜合資料查詢，包括里程、油耗、警情次數、駕駛時長、駕駛得分查詢。 2.2里程油耗統計對車輛某一時間段內的里程、油耗和駕駛時長進行統計，以圖表形式展示，管理員可以對比每個月的里程油耗情況。 2.3警情統計可以查看車輛發生警情的類型和次數，點擊明細，可以查看每個車輛的警情次數詳情。 3. 消息處理查看車輛的警情消息，消息提醒在應用和手機推送同時進行。 4. 設置 APP的相關系統設置，登錄密碼的修改等。 APP isdivided into four modules 1. Location Services Online real-timelocation of vehicles, information and travel path of the vehicle.2. The statistical reports Statistical vehicle information,including consolidated statements, gas mileage reports, policeintelligence table, driver behavior reports. 2.1 General StatisticsComprehensive information on the vehicle for a certain period oftime queries, including mileage, fuel consumption, the number ofpolice intelligence, while driving long driving score query. 2.2gas mileage statistics For a period of vehicle mileage, fuelconsumption and driving long proceeds statistics, graphicallydisplay, administrators can compare the gas mileage situation eachmonth. 2.3 alarm statistics You can view the alarm type and numberof the vehicle is involved, click Details, you can view the detailsof each alarm number of the vehicle. 3. 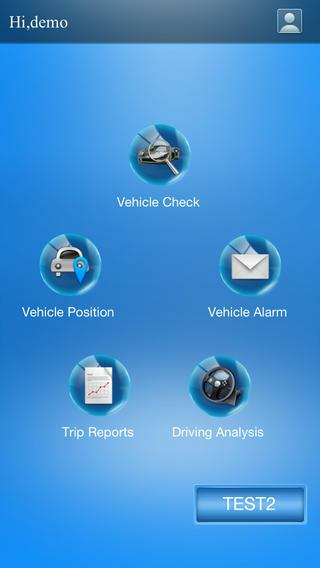 Message Processing View ofthe vehicle alarm messages, message alerts and mobile push in theapplication simultaneously. 4. Set APP-related system settings,password changes and so on. APP mainly monitor valuables, Jewelry Guard offering visiablelocation info,user-friendly command ,parameters setting,convenientfor users to monitor valuables in real-time to avoid any loss. The APP provides visualization ofgeographicallocation information for Castel family businessproducts, thehumanized instructions issued and parameter settingenables theuser to track and monitor other Castel family businessproducts atthe same time. Your connected car Car scanning, diagnostic, monitoring and logbooktool: reads real-time and stored diagnostics parameters from ECU ofOBD-II compliant cars. Before purchasing please check the car andadapter compatibility with free version of inCarDocrhttps://goo.gl/imxGhN Note!!! Requires ELM 327 or compatibleadapter. Supported: OBD-II (Bluetooth, WiFi, Kiwi 3 (BLE), iCar 3(BLE), Vinli); GPS-only and Demo modes. Read more at site sitehttp://incardoc.com Limited functionality available w/o ELM 327adapter possible only in GPS mode: Speed, Altitude Pro versionfeatures: • real time parameters recording • read & displaymultiple parameters • recording parameters in background mode •view recorded parameters traces • GPS traces support • upload toserver http://incardoc.com • extended widgets: fuel economy,acceleration • overlay to present economy data over any applicationscreen Car diagnostics Works as fault code scanner: read CheckEngine (MIL) state, details, related freeze frame data, finddescriptions and clean stored diagnostic trouble codes (DTC). Storeand share diagnostics data when looking for a professionalservice/repair assistance. Please note that app supports onlyparameters and ECU's specified with OBD-II standard, that is Engineand Emission systems. Real-time parameters Reads real-time engineand vehicle OBD2 parameters from car’s sensors: speed, rotation(rpm), coolant temperature, pressure, lambda and multiple othersensors data supported by your car. Supported chart drawing andanalog/digital widgets presentation. Please note that exact list ofexposed parameters depends on your car make/model/year. 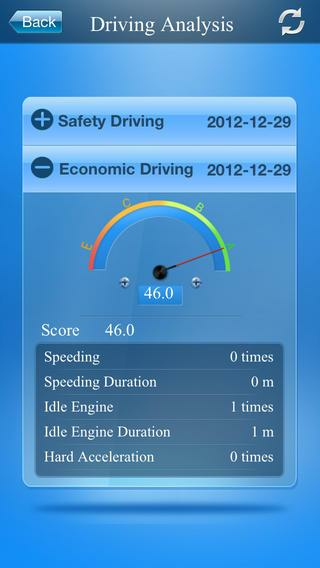 EconomizerSpecial mode for presenting and tracking car’s fueleconomy/consumption. Allows to present both in-drive (instant andaverage MPG) as well as per trip, per day and other statistics.Please note, that feature available when appropriate economyparameters (MAF or MAP+IAT+RPM) supported in your car. For correctcalculation you may need to enter proper Engine displacement (incubic cm) and volumetric efficiency (in %, the default is 80).Other features: • logbook notes: fueling, service records, carmaintenance, diagnostics • GPS parameters: speed, altitude •register and upload data to web • console mode: for advanced users,direct OBD2 and ELM327 commands sending • use custom configurationsfor non-standard parameters and protocols 🌐 sitehttp://incardoc.com Required permissions: • Device & apphistory Used to self- identify application when at background •Location Extra GPS parameters: GPS speed, altitude, position forfueling and service search • Photos/Media/Files Store and read"Logbook" and Debug data as direct user's actions • Other Bluetoothrelated - communication with external adapter Internet related -publishing "Logbook" records to server as direct user's actionsDrawing over other apps – presenting economy and selectedparameters over other app’s screens Warning!!! There are reports onconnection issues when using some cheap "clones" of ELM327 (mostlymarked as v2.1)! Read more at our forum https://goo.gl/9qiBSv Youare always welcome @ 🌐 our site http://incardoc.com Thank you!!! This all-in-one Vehicle Diagnostic and Performance Scanner lets youview real-time data and Check Engine Light trouble codes fromalmost any OBD-II (1996+) vehicle. You can view vehicle data andrecord vehicle data for future viewing. Re-load saved scans andeven export saved scans to Excel spreadsheet. With one simplecommand you can read the vehicle trouble codes (Check Engine Light)and save them for future viewing or use the email feature to sendthem to someone. It will also let you clear your trouble codes andturn off your check engine light with one simple command. *Superquick refresh rate allows for optimal real-time scanning.This appwill allow you to read the following from your car's on boardcomputer:-Speed-RPM-Mass Airflow-Manifold Absolute Pressure-Boost(PSI)-Ignition Timing Advance-Throttle Position-MPG-EngineTemperature-Intake Air Temperature-Long Term Fuel Trims-Short TermFuel Trims-Barometric Pressure-Ambient Air Temperature-EngineLoad-Fuel Pressure-Fuel Level (%)-Engine Run Time-EquivRatio-Oxygen Sensors (O2 Sensors)-Fuel System Status* Or simplyenter your own CUSTOM PID's. This is great if you have a list ofyour vehicle's specific PID's. You can enter your own PID's andspecify the math you would like to perform and the desired unitsyou would like the pid to display.Record live OBD-II Data in realtime and save it for future viewing. Export your saved scans toExcel-Scan live fuel economy in imperical or metric.-Set fueleconomy calculations to use MAF or MAP mode.-Read PSI/Boost (Forturbo/supercharged cars).-Customize the layout of obd parameters onthe screen.-Show readings in imperical or metric.-Advanced ELM327Adapter Reset/Information Readout.-Show current trouble codes.-Savecurrent trouble codes.-Email current trouble codes.-Turn off(Reset) Check Engine Light.This app also gives you tips andsuggestions to help you through processes. *Developed byprofessional OBD-II tuners with 15 years field experience in OBD-IIAutomotive vehicle flashing and diagnostic scanning. This app isgreat for tuners wishing to view/record all the importantparameters in a nicely laid out easy to read screen. *Works on allvehicles that have an OBD-II interface (Most vehicles made on orafter 1996)*Requires any ELM327 Bluetooth device (you may purchasethe device from within the app if you don't have one)*PLX KiwiELM327 Bluetooth device: For a top of the line device, we recommendusing the PLX Kiwi (Bluetooth). We have a direct relationship withPLX and our app is PLX certified to work with the Kiwi.For moreinformation on the Kiwi adapter, check here:http://www.plxdevices.com/product_info.php?id=GSSTBLUETOOTH*Tablets- This app is optimized and will work on all screen sizes,including tablets! *SUPPORT* - Feel free to contact us at any timewith questions, issues, suggestions, etc: [email protected]*Missing Menu button - note, on some newer phones such as Galaxy S5and HTC One, a select few are reporting that they are not seeingthe soft menu button show up in the app. All you need to do is hardpress the home button on the phone while you are in the app and themenu button will show up. For S5 users, press and hold down themultitask key. * Bluetooth Connection - Note, any experience of notbeing able to connect to your vehicle may mean another bluetoothenabled app is holding the connection to your ELM device. Make sureany other bluetooth apps are not connected to the ELM327. *PANDORA*- If you have Pandora on your phone and are unable to connect toyour ELM device, try disabling Pandora and reconnect. *Features* -If you don't see something in the app that you would like to see,shoot us an email request. We are currently working on the nextversion and want to know what you want that we are not yet givingyou! Market leading dashcam and eco-driving assistant withOBD!Experience the stable background operation as well as no gapsbetween recorded files on Android 4.1 or higher devices!- Videodashcam supporting resolution and quality control up to full HD(1920x1080),- Camera exposure and focus control (depending oncapabilities of phones),- Auto file deletion for normal/emergencyvideo, - Emergency report via SMS, call and YouTube upload,- Carmonitoring with connection of ELM327 compatible OBD dongles, - RPM,Speed, Battery voltage, coolant temperature, Baro pressure, andmany more data (depending on cars),- Fuel-cut, eco-drive level,harsh acceleration/brake, idling indicator, - Auto launch andtermination options, - Co-working with Android Wear devices fornotification and control We recommend smartphones with Android 4.0or higher, but most smartphones with Android 2.2 or higher aresupported too. Android 2.2 or lower devices will not be officiallysupported from CaroO v2.3.0. Before your purchase, please use thefree version, CaroO Free Driving Recorder, in advance.If you haveany problems or difficulties to use this app, please use the logbutton on the main screen and send log files to us. This Software can erase/read Volkswagen, Audi, Seat, Skoda DTCFault memory in all ECU`s at once by OBDII.Works with VAG carsstart from year 2005 with CAN gateway.Any third party ELM327Bluetooth OBD adapter can be used for this.except some models:i.e.Skoda Fabia, VW Polo, VW Lupo to year 2009 ELM327 compatibleBluetooth adapter must be used1. Plug ELM327 to car OBDII connector2. Run software on your Smart phone Wait few seconds and all errorsin all electronic systems will be erased.Some faults cannot becleared (such as internal ECU faults) and the control module mayexplicitly refuse. Be aware, clearing fault Codes does not fix theproblem that caused the fault! An OBD2 car diagnostic scanner app that uses a low-cost bluetoothELM327 adapters to connect to your car OBD2 bus.Main features:1)Dashboard("carputer"): View live OBD2 engine data on your Androidphone - Connect to your vehicle ECU2) OBD auto doctor app: retrieveFault Codes (DTC's or OBD check engine fault codes) and clear CheckEngine lights - View fault descriptions using the built-indatabases(all fault codes and descriptions gave from factoryservice stations and guaranteed 100%).For testing our trouble codesdatabase you can use this DTC: P0171, P0300, P0340, P0301, P0420,P0172, P0141, P0303, P0113, P0134.3) Engine performance data - 0 to60, 0-100 km/h4) Can help you fix your car and helps keep carrepair costs down!5) KPL for Petrol/Gasoline vehicles.6) Also thatapp can decode car dashboard icons and show description on eachicon that can find.Works on vehicles made by Ford,GM/Vauxhall/Opel, Chrysler, Mercedes, Volkswagen, Audi, Jaguar,Citroen, Peugeot, Skoda, Kia, Mazda, Lexus, Daewoo, Renault,Mitsubishi, Nissan, Honda, Hyundai, BMW, Toyota, Seat, Dodge, Jeep,Pontiac, Subaru and many more vehicle makes, European, US, FarEast, etc. 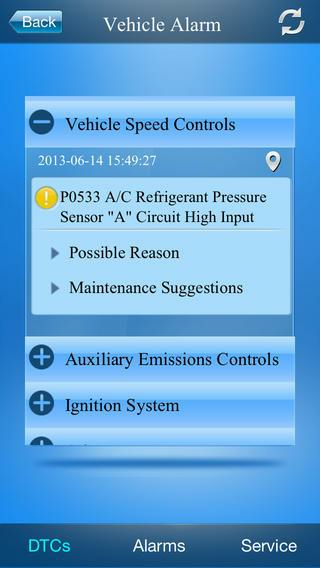 Some vehicle ECUs may support more/less features thanothers.Become a beta-tester: https://goo.gl/TO5ZFpAttention: wehave app version for Apple iOS devices that can connect to ELM327WiFi adapter and read trouble codes(DTC) from car ECU, but we needto testing connectivity with few different cars. We need your help- become our Apple Beta tester!To grant access to beta version weneed your e-mail - send any letter to [email protected] and get reply withinvite URL! Measure the power of your car with this simple tool! All you needis a cheap ELM327 device.Note the result is WHP (Wheel HP) which isless than the actual engine power output, due to drivetrainlosses.The actual engine power is 10 - 20 % above the displayedresults and depends on your configuration. (Standard / automatic,AWD, etc).Beside the Dyno function, you can read and CLEARdiagnostic trouble codes and read real time ecu data.Preferredusage: connect to ecu,drive in second gear around idle speed, pressstart button.Give full throttle until engine speed reaches the rpmlimit (or less).The car weight field should be set to gross weight:curb weight + fuel weight + passenger(s) weight.Safety first!Consider taking the measurement on a private / closed road with ahelper using the app while you drive.